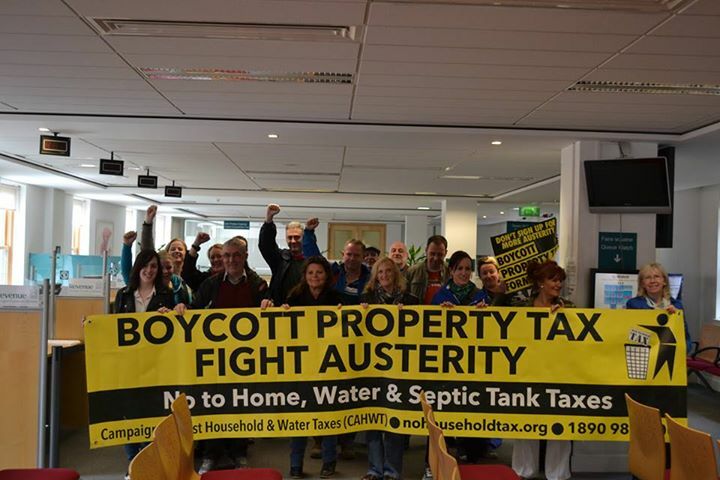 No to the Property, Water & Septic Tank Taxes – No to Deduction at Source. No to all Austerity – ordinary people have paid enough. For a united movement of ordinary people affected by home taxes and austerity – no to divisions based on race or nationality. Tax the Wealthy as the alternative to austerity: For progressive taxation on the wealthy and corporate sector. End the bailouts of banks and bondholders, instead use the money to create real jobs through a programme of necessary public works. Fight against plans for Water Metering, Water Taxes and Water Privatisation. Oppose all cuts in council services or erosion of workers conditions. Make no deals on the Council with the austerity Parties (FF, FG, LP). Oppose the gravy train – no participation in junkets. Demand local planning for the community, not for developers or vested interests. What attitude should Marxists take to this electoral initiative? Just like every other party standing in an election it must surely be judged by what it says – by its professed programme or set of policies, providing of course these are also what it truly represents. Can and should it be supported? The electoral slate is clearly not a party and was organised by the Campaign Against Property Tax and Austerity but the logic of standing in an election is to act like a party and even more so if elected. The failure of the Unite Left Alliance to do so has led to its demise. The policies above are no way different from that of the ULA, except more limited. The Left has argued over the last number of years that elections and those elected are there to advance ‘real’ struggles outside of parliament and council chambers. The last few years have demonstrated conclusively however that it is the other way round – struggles in communities and estates have been means to advance electoral ambitions. Electoralism is a dirty word on the Left but nothing would appear to describe the method of organising so accurately. This initiative, the promised first of many, must be judged firstly on its own terms. The short summary of its aims says it is against austerity and the various taxes that have made up a large part of this agenda. The anti-property tax has failed so it will have to be explained how standing in elections will bring success. Otherwise voters are being asked to vote for good intentions. Councils can clearly not change the policy of central government so how will the taxes and austerity more generally be blocked and reversed? No concrete and practical way forward is put forward. Maybe it will be, but if it isn’t then it is purely propaganda. If the reason for standing is to build the campaign this should be the main point of the programme but even here it should be explained how the campaign will achieve its aims. Is, or rather was, a mass boycott a road forward given deduction at source? If not what is the alternative – a mass political campaign aimed at persuading tax workers to refuse implementation of the tax? What role is there for councils? Are enough candidates standing to win a majority? If so what would they do with such a majority? Can they unite with other similarly minded councils to campaign against the tax? What powers do councils have to frustrate or prevent this tax or austerity? Will the new council promote workers control or ownership of council services? What other steps will it take to promote the democratisation of local government? If there is no possibility of winning a majority then what role would those elected take? Will they release all information currently withheld on council activities? How will they frustrate the local implementation of austerity? If these questions aren’t put to the fore then, as I’ve said, what we are seeing is purely propaganda. This does not mean that this aspect should be underestimated. Even in periods of limited struggle, in fact particularly in such periods, the task of socialists is to try to educate as many workers as possible through propaganda. Given the very small size of the socialist movement in Ireland this is by far and away its biggest task. If it doesn’t get this right then the majority of what it is capable of doing is wasted if not positively harmful. I have shown what is wrong with the idea you can tax the wealthy here and here so I won’t repeat my arguments again in this post. The main problem is that it is not the wealth or high incomes of the rich that are the cause of austerity so even if it were possible to tax both effectively the cause of austerity would persist. This cause is the economic crisis. Because the economic system is a capitalist one the elementary task of a manifesto would be to state this and explain it. Explain exactly how the way the capitalist system works has given rise to this crisis and will create more in future. This would be necessary in order to argue that the alternative to austerity from a working class point of view is socialism. Explaining what this is would involve is an obvious next step – expropriation of capitalist ownership and workers ownership in its place and a workers’ state in place of the existing state. Complaining that the programme does not mention socialism is not the problem since the programme is not a socialist one. If this is the way it is then it is better that it does not claim to be socialist. The programme proposes ending the bailouts of banks but does not explain how this might be done, the consequences or the alternatives. Some of these issues are touched upon here, here and here. How is the debt to be repudiated? What debt is to be repudiated? How would credit be provided if the banks were allowed to fail? Anyone who begins to think seriously about what “ending the bailouts” means will have these questions in their head and without an answer they will be open to accepting right wing claims that such proposals are not thought through , cannot be implemented or would be even more disastrous than what we already have. Dealing with such claims is the important task of propaganda and at this point in time elections are useful means of getting across the message. In the absence of all this the message put across is a radical Keynesian one, that is a capitalist one. One that is temporarily more beneficial to working people but one, if followed,that would lead to inflation, wage cuts, unemployment, and calls for reducing budget deficits and tax increases later on. That’s if it worked in the meantime! From a political point of view therefore the programme does not assert separate working class politics but, in so far as it puts forward an alternative, puts forward the benign actions of the capitalist state as the solution. It therefore doesn’t even get to first base in terms of a socialist alternative. It may therefore be reformist but it isn’t working class reformism because it seems to rely solely on pressurising the state. In terms of the reformist/revolutionary dichotomy it isn’t even the former since it lacks the courage of its convictions and fails to propose a Left Government for the Dail that could tax the rich and the corporations; burn the bondholders and use the money to create jobs in the public (read – capitalist state) sector. A socialist programme would explain that fighting austerity is required to defend our living conditions but that this will ultimately fail unless the system is replaced. Austerity can at best be ameliorated but such is the depth of the crisis it cannot be entirely halted and reversed under the present economic system. Some will deny this and claim that austerity can be ended without changing the system; that the rich can be made to pay for their crisis and that policies of growth will ensure that this can happen. On the other side will be those who will claim that austerity is an inevitable result of an economic crisis, which is caused by the capitalist system in its attempts to produce and accumulate capital beyond the conditions that allow it reproduce itself harmoniously. The excessive expansion of credit is always a feature of capitalist crisis and the bigger the boom the bigger the bust, unless even more credit is injected into the economy in which case the bigger the boom . . . No amount of regulation or honest government can prevent this without seriously gumming up the capitalist system, in which case you simply have a different sort of crisis with very much the same symptoms of unemployment etc. On the first side of this debate will be the liberal defenders of Keynes, including their economists and leaders of the trade unions. On the second, socialists, who can only consistently defend their ideas by understanding and presenting the arguments of Karl Marx, which is the reason Marx wrote ‘Capital’. A recent post on the Michael Roberts blog has a couple of interesting points to make about these arguments. He points to research showing that inequality of income reduced between 1910 and 1950 across the OECD (most advanced) countries, which calls into question the idea that capitalist crisis is a result of inequality that progressive taxation could cure. This period, after all, covers the great depression of the 1930s. The origin and cause is capitalist ownership of the means of production, including its purchase of labour power, its ownership of capital and the money and power this involves. It is the relations of production in which workers have to sell their ability to work to a class of owners of the means of production that produces the gross inequalities in society. Redistributing what is already produced, even were it possible, would not overturn this power relationship or the exploitation and oppression involved because it does not get to the heart of the matter. In a country where little or nothing of this is understood the elementary task of socialists is to explain this to as wide a number of workers as possible and elections should be taken as an opportunity to do so. So we are back to our question – should this electoral initiative be supported? To the extent it has been judged as a more or less adequate immediate guide to action or corresponds to the educational needs of the working class the verdict would appear to be no. Perhaps unity could not be agreed between the participants on any other basis and what we see is a campaign standing in an election not a party. But was any other basis proposed or offered? Was any discussed or do the participants see no problem in the platform of a campaign being adequate to a programme for an election? 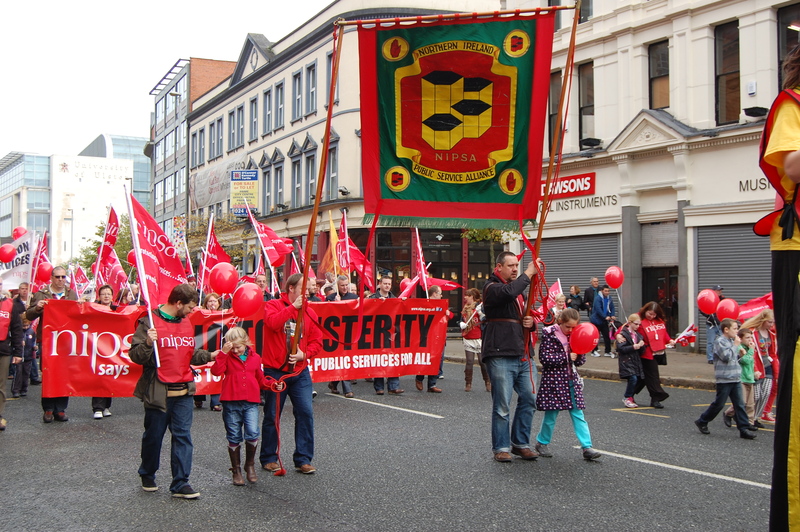 It might truthfully be said that the low level of the programme reflects the low level of Irish workers’ class consciousness but this is not a way out of objections to it, for there is nothing in it to advance Irish workers’ understanding of the cause of the austerity they face or the great changes that are required to defeat it and establish a new society. The only conditions upon which it would be possible to support this initiative is if it went further in arguing the socialist case or if it raised the prospect of invigorating a section of workers into activity, in which case through this activity they may learn about the roots of their predicament and themselves go beyond the timidity of the anti-austerity campaign. To do the latter they may have to go beyond the existing Left groups who save what they think is socialism for potential recruits while the broader class of workers they address in electoral material, the purported agent of revolution, are fed re-heated capitalist reforms. 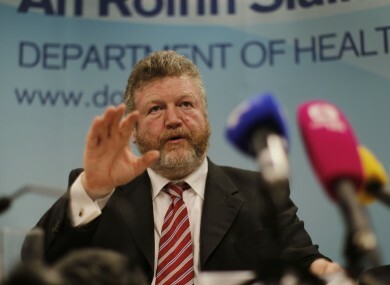 The 2013 budget is going to introduce tax increases and spending cuts of €3.5 billion. Michael Noonan smiled when holding up the budget document to the cameras while Brendan Howlin looked serious. Nevertheless RTE reported that Labour TDs were pleased claiming that their fingerprints were all over it. And so they are. Their footprints, where they walked all over many vulnerable sectors of society, are also all over the budget. There has essentially been only one defence of these austerity budgets and that is that the Government has had no choice. No choice because there is no economic alternative and no choice because the State has lost its economic sovereignty and is basically doing what it is told to by the Troika of European Commission, European Central Bank and International Monetary Fund. In this budget they have felt compelled to come up with a new defence – it is nearly over. This was trumpeted by Michael Noonan and also claimed by the Labour leader that “It is the budget that is going to get us to 85% of the adjustment that has to be made, and will therefore put the end in sight for these types of measures and these types of budgets”. This hardly looks credible, which is not good news, because what it essentially means is that the austerity measures implemented have both been insufficient and haven’t worked. The economy has contracted and stagnated even as the austerity measures have been insufficient to bridge the deficit. For 2012, the deficit has turned out to be around €500 million larger than planned but because of upward revisions to data from earlier years, the deficit target, set as a percentage of GDP, will still be hit. This assistance in meeting the ‘target’ will not be available in 2013. At the end of 2013 the deficit will be 7.5% of GDP. In 2008 (excluding that related to the banking bail out) it was 7.3% rising to 11.5% in 2009. All the austerity budgets have achieved so far is a reduction of 4% – less than half way to eradicating the budget deficit never mind 85% of the way. Even by 2017 the IMF forecasts the deficit will be 1.8% so the debt will still be getting bigger. As with all these budgets there have been cuts to capital expenditure with another €500 million reduction targeted for 2013. In 2008, capital expenditure was close to €10 billion. In 2013, it will be under €3.5 billion. Public capital expenditure has been slashed by 66% which wipes out, and more, the so-called stimulus measures announced earlier in the government’s PR/con exercise that claimed to be promoting jobs. This means the infrastructure of the state, economy and society will disintegrate more or less quickly. The sheer madness of the austerity agenda is demonstrated by the fact that the €3.5 billion in cuts and tax increases will be wiped out before they are even implemented by the €3 billion payment of the promissory notes for the Anglo-Irish bank, which no longer exists, and repayments of €2.45 billion of bonds for Irish Life & Permanent. On top of this there is the rising interest cost of the debt, which will increase from €5.7bn in 2012 to €8.1 billion in 2012-13. With the debt increasing, even at a reduced rate of increase, the burden of interest payments on it can only worsen. This makes the debt unsustainable. A rising interest burden will be a permanent anchor on growth. This is a problem because the Government is relying on renewed economic growth to get out of the stagnation now in place. The weakness of Irish capitalism means that it must rely on outside forces for this growth. Either that or there is some debt relief to lower the amount of debt and the burden of interest payments. In the meantime particular groups of the working class will suffer real hardship, living standards will decline or at best stagnate and unemployment will be limited only by continuing emigration. The stresses imposed on society will be expressed in mounting social problems that will often be presented as a simple increase in personal misfortune while increased inequality will coarsen social relations and further weaken social solidarity. The absence of any radical perspective will see reactionary prejudice become common currency. Once again the United Left Alliance has put forward what it states is a socialist alternative. In substance it is the same argument as that put forward last year but with more detail and some development here and there. There is no need to repeat the analysis presented earlier in this blog including here, here and here. The ULA is in no position to implement any of its proposals. The purpose of the document must therefore be an educational one. What it teaches is therefore the only useful criterion by which to judge it. It starts out by claiming to be a socialist alternative and its headline is repudiation of the debt, an end to austerity and the need to invest in jobs and services. All these are undoubtedly the immediate needs of the working class. The problems start when we look to see how it is proposed these ends might be achieved. The ULA “proposes to take the burden of the crisis off working people, improve their lives and revive the Irish economy.” On the other hand it admits that “the budgetary proposals put forward by the ULA can in no way offer a comprehensive solution to the crisis we face.” How the first claim is reconciled to the second is not explained. While the debt crisis “resulted entirely from the actions of developers, bankers and the politicians who facilitated them” it is not explained how this can be reconciled to it being “a manifestation of a deep structural crisis of global capitalism.” It is nowhere explained what this latter statement means, how it explains what has happened or how it explains what solutions are possible. The Marxism to which the core elements of the ULA claim commitment is founded on claims to present just such answers but they are not here. It might, with some justification, be claimed that the precise cause of the crisis is also a cause of some debate within Marxism. Unfortunately any suggestion that a key task of the ULA might be to debate this out so as to inform the politics it espouses would be held up many as a fetish of sectarian or dogmatic individuals who aren’t interested in practically ‘building the movement’, or some other such boorish remark. Instead while (dumbed down) Marxism is relegated to recruitment meetings for novices the vacuum that is the politics presented to workers is filled with Keynesian, that is capitalist, ideas that are the currency of liberals and the leaders of the trade unions. Let us see some ways in which this is expressed in the ULA economic alternative. First the ULA proposes to improve the lives of working people and revive the Irish economy but there are no socialist measures proposed that would achieve this. Were the proposals to therefore fail (if by some miracle they were tried) it would discredit what passes itself as socialism while if they were to succeed they would go some way to making socialism irrelevant. 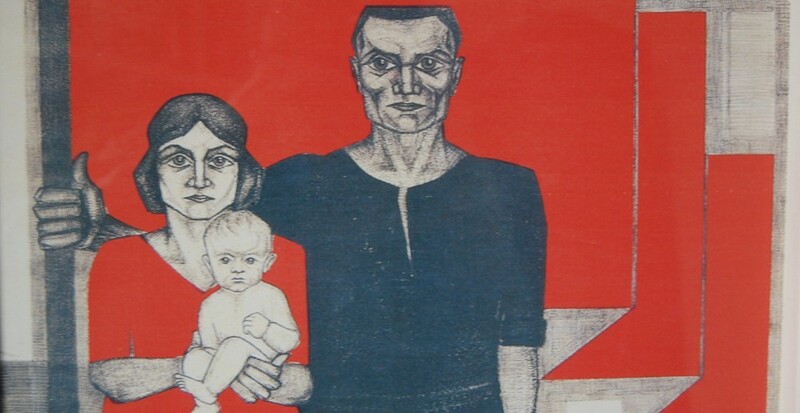 “There is a need for active struggles to demand policies that prioritise the need for jobs, public services and growth, using public investment and democratic socialist planning to chart a way out of the current crisis.” What sort of struggles? For what policies? And who will we demand this of? How would they deliver on it? What, who and how? Where and when don’t even arise given the vacuousness of this string of words. In other words – as a vehicle for education – the alternative budget, when it is not mistaken, as we have explained in earlier posts, is simply incoherent. What is clear is that the ULA has no strategic perspective. It calls for socialist planning, but socialist planning is just another term for working class rule, for the working class controlling society. Yet it proposes the state, the capitalist state, take action in the here and now to solve the crisis and develop the economy on a “sustainable basis”. This lack of coherence reveals itself in timidity, contradiction and calls for solutions that have already been the means to subordinate and exploit the working class; as when the ULA calls for “full nationalisation with direct public control of the banks” when it is nationalisation and state control of the banks that has been the mechanism to burden workers with the debts of the speculators. Even when it calls for “direct public control of the banks” this can as easily be defined as the current arrangements as it might by workers control. So how does such a demand clarify anything? How does it educate anyone on what they should fight for? The ULA is currently undergoing an organisational crisis but its real problems are political. It argues an alternative that is simply not based on the actions of the working class. It is imperfectly aware of this so it substitutes vague calls for action and acknowledgements that what they are proposing is only temporary amelioration. There is a possible solution to this problem and it involves debating openly and democratically what a socialist strategy should be. As I have said such calls are resisted. It therefore falls to those prepared to do so to engage in such a debate so that we don’t just point out what’s wrong but also say what’s right. Should we call for a general strike? Two questions immediately arise from such a call. What is the purpose of a general strike and how would one be brought about? It is not stated explicitly by any of the groups demanding one but it must be assumed by the criticism of the failure of demonstrations and previous action, that the purpose a general strike is to stop austerity. Unfortunately reference to Spain, Portugal and Greece does not support such a claim. In all countries austerity has continued, if not intensified, despite general strikes. In fact, as we have noted here and in an earlier post Greece has had a huge number of general strikes but austerity there is the worst. So at the very least supporters of a general strike owe it to everyone to explain in what way it will work to achieve a specific purpose. An argument can be made that a general strike will prevent austerity getting worse but again this is not the Greek experience. It can be argued that the situation would be worse if there was no resistance and as socialists we could all agree with this but this is not the argument being made, in so far as there is one. This argument appears to be that a general strike will not just prevent austerity from being worse than it might otherwise be but that it would stop austerity, or at least prevent it deepening. The Socialist Party article claims that a general strike might destroy the Government. This is doubtful but even if it were true the experience of Greece bears witness to falling governments and continuing austerity. So if the purpose of a general strike is not apparent the means by which one could be brought about seems even less clear. Two problems are posed. What is the role of the Irish Congress of Trade Unions (ICTU) and the trade union leadership generally and what is the role of the Left and rank and file activists inside and outside the trade unions? Two criticisms of the approach of some on the Left have been levelled here. It is argued that while the call for a general strike is a good one it is a mistake to pose it as a demand on the rotten ICTU leadership. This is because such a demand would confuse those working people looking to the ULA through implying ICTU would carry through on such a call. Even if forced to give nominal support their role would be to minimise its impact and undermine its success. 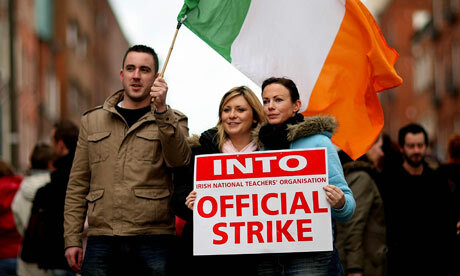 Any mention of ICTU should be to expose their role not imply that they could be on our side. It is clear, from the size of the anti-austerity demonstration compared to that of earlier ICTU organised events, that there is currently not a large enough unofficial or rank and file movement either within or outside the trade unions calling for, never mind in a position to organise, a general strike. It is not on this basis a realistic short term possibility. At the moment the only body with the authority, credibility and organisation to call a general strike is ICTU. It is the unchallenged leadership of the trade union movement and of the vast majority of its members. However much we might regret that fact it is nevertheless the case. Unrivalled in its position of leadership it certainly has the authority no other grouping has. It is the only body currently, which if it issued a call, would be seen as credibly being able to threaten the Government with such an action. There is no other organisation with the capacity to mobilise the trade union membership and organise a general strike. However much we also reject their claim to be against austerity the majority of Irish workers have not consciously rejected their leadership. The vast majority of workers not totally cynical either accept that all that can be done is being done or that austerity is inevitable or that they wish, hope or believe that something more could be done but don’t know what that something is or how it could be made to come about. Irish workers are angry but they have no clear idea about what to do about it and have no clear and united vision of what the alternative might be. The general election that voted in a Fine Gael dominated Government and the passing of the Austerity Treaty referendum are confirmation of this. This means that ICTU cannot be ignored and that the problem is not that of creating illusions in ICTU that are not there but destroying the vast illusions or acquiescence in their role that is there. So if we should agree that on their own ICTU will not call a general strike, and would attempt to neuter it of its potential if it did, we are left with a recognition that we are not in a position to make a general strike anything more than a propaganda demand that lays the foundations for possible realisation of it in the less immediatefuture. All the Left argues we need a campaign against austerity but it would be putting its money where its mouth is if it were able to debate openly and come to an agreed decision on how such a campaign should be built. At the moment there is no agreed position on this. The ULA has unfortunately signally failed to unite the Left in an anti-austerity campaign with an agreed policy and perspective. If it cannot unite itself it has to explain how the working class will be united in a general strike against the Government. A first step in such a task would be to determine the role of a general strike in the struggle against austerity. A 24 hour general strike would be clear evidence of the potential power and organisation of the working class. To even achieve the level of organisation beforehand that would be required to make it a success would indicate a jump in political consciousness and capacity to independently organise. Success in carrying it off would add to this class consciousness and capacity. It would demonstrate to the Government the opposition to it that exists and the potential for it to be toppled. But after 24 hours everyone would have to go back to work and the question would have to be what next? Everyone, including the Government, would know this. In Greece some socialists are speaking of an indefinite general strike but such a call really is a challenge for political power in one form or another and who believes the Irish working class is remotely in a position to issue such a challenge? A general strike therefore can only be the product of a prior campaign that was able to extend enormously the consciousness and organisational capacity of the working class. From where we are now it is clear that a campaign for a general strike would have to argue that this should be the demand of the whole trade union movement and wider forces. This means fighting for it to be the demand of ICTU. Such a campaign would have the aim not of passing resolutions calling on the current leadership to call a strike, although this would be one necessary approach, but would fundamentally be about building a movement within (and outside) the trade unions to win support for it from ordinary workers and making them capable of carrying out a general strike with or without and probably against the leadership of ICTU. We are a long way from that at the moment. 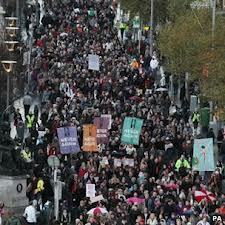 The call for a general strike however is only one rallying point for a campaign against austerity. Workers not only suffer from austerity they also implement it. In order to impose the property tax workers must process the bills. In order to close services workers must accept that they close. In such cases campaigns must be built that boycott processing of new taxes, wage cuts and redundancies etc and which occupy services threatened with cutbacks or closure, or related workplaces that have been spared. Taking over the workplace is often a more effective form of action than walking out of it. Such actions have begun in Greece. All of this means that workers must have effective control over their own organisations. This is either through fighting to democratise existing organisations that have been bureaucratised such as the trade unions or creating real democratic organisations from the new campaigns against austerity, the property tax etc that have been or will be created. Within such a perspective the culminating point, the objective, is not a general strike but the advancing organisation, consciousness and power of the working class movement. The question of a general strike is one (important) one of many. Any significant advance along this road would raise the question of a working class political party. Such a perspective allows us to start from where we are without seeming to pose currently unrealistic objectives. It is designed to build solid foundations and to go as far as it can without thereby suffering failure because it has not achieved everything. It is not saddled with a perspective based on one determining clash of forces that it will fail, until that is it might be capable of offering such a battle with some confidence of success. It is built on the workers themselves and not concessions from the State that are under the State’s control and can be pulled back later. It is a movement of opposition that teaches workers to rely on themselves and not on the State and not on Left TDs passing legislation that will supposedly make the rich pay for the crisis. In other words the debate on a general strike cannot be divorced from the problems thrown up by austerity and the resistance to it more generally. Other questions and issues around this have been put forward by the Left. Is the Socialist Party correct that the Campaign against Household and Water Taxes is key? Is it true that “the property tax issue can become a vital issue to defeat not just the Government’s agenda for more home taxes but to undermine the entire austerity agenda itself”. What is the role of the Labour Party and its links with the trade union leadership in betraying any fight against austerity? A debate on what the purpose of a general strike is – what it is expected to achieve – and how such a call can be put forward as a practical objective, if at all, is necessary.